In 1921, American-born wildlife and landscape artist Belmore Browne and his wife Evelyne purchased a one-room log cabin at 124 Spray Avenue. The small cabin served as a summer home for the family for more than twenty years. The Brownes named the property "Illahee," which is the Eskimo-Aleut language word for "home." They later enlarged the building by adding a living room, bedroom, and artist's studio. As an artist, Browne sought inspiration from his travels throughout the Canadian Rocky Mountains. He was also an avid mountaineer and was a member of one of the first parties to attempt Mt. McKinley in Alaska in 1912. In honour of his expedition, a feature of the Alaskan mountain was named "Browne Tower." Browne also climbed regularly in the Canadian Rockies, and spent much of his time exploring the peaks of Kananaskis Country. The original Browne cabin was a one-and-a-half storey log structure, with a side gable roof and a distinct Rundlestone fireplace. In addition to the main residence, several secondary buildings were located on the site. These included a fuel shed and horse shed, both constructed of log, as well as a stable constructed of rough wood siding. The Brownes sold Illahee to Edward and Margaret White in 1945. 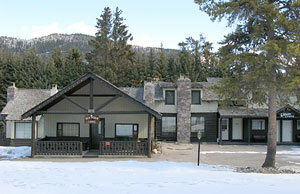 Though the original log structure and Rundlestone fireplace are still intact, years of additions and renovations have transformed the building into the tourist inn known today as Elkhorn Lodge. 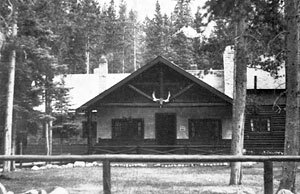 If you would like to view the lodge in person, be sure to pick up a copy of the brochure Walking Through Banff's History, produced by the Banff Heritage Corporation. In partnership with the Archives at the Whyte Museum of the Canadian Rockies, the Banff Heritage Corporation is proud to profile this significant heritage resource as part of its Landmarks and Legends Series. In recognition of the knowledge of Banff's history within the community, we welcome public input that may provide further insight into this or other profiles in the Landmarks and Legends series. For more information please contact the Town of Banff Heritage Planner at 403.762.1216.